Everything to do with my work is inspired by nature and my organic environment. My jewellery related inspiration and what I choose to wear is entirely inspired by Tribal and Ethnic jewellery. To anyone who has met me, they would have seen me with a few pieces i have made but also large earrings, chunky necklaces and all things tribal. There is something in its honest design and craftsmanship which I admire. TRIBU is a site which I recently came across that I thought i would share. Yep, Finally made it back to the bench, so i'm clearing out the studio of old work to start fresh over the xmas break back in Brisbane. 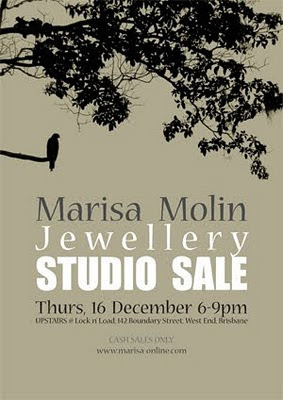 You are invited to preview my works which include jewellery, sketches and gift cards. Delectable nibblies will be provided and you are welcome to purchase a refreshment from the bar before making your way upstairs . 142 Boundary Street, West End, Brisbane. You are welcome to bring friends and family to come along for a drink, shop, even a welcome home cuddle!